Want to share or know more about universal symbols? MASONIC SYMBOLS OF POWER IN THEIR SEAT OF POWER -- WASHINGTON, D.C.
You need to be a member of Universal Symbols Focus Group to add comments! New in the group, I hope I can learn a lot about symbolism from you all. MY inner self is always urging me to do things BUt for years i just never listened then on the last Lunar eclipse. I saw a huge flash of white light and i felt so odd at first i dis-missed it as we have been so trained by the drak ones to do . Now though in life i don't "think " i mean yeah i still very much do i just follow my heart and soul. things are becoming much better in my life . So thank you all I LOVE YOU . Beautiful pictures Flaviox and Averran, thank you for posting. Namaste.Good day to All of You. The Alliance Protection Symbol......DOES WORK !!!!!!!!!! Greetings to my friends. Thanks for accepting me. Blessings to........J. GOD BLESS THE ASHTAR COMMAND & THE GALACTIC FEDERATION. Thanks for let me join. comment......A LOT GOING ON UP THERE !!!!!!!!!!!!!! The “Antahkarana” is an ancient Tibetan/ Chinese meditation symbol. This powerful symbol focuses and deepens meditation and enhances the actions of healing energies. It brings in grounding energies which connect the person to the earth and creates a continuous flow of this energy through the chakras. It helps in neutralizing negative energy that has collected in objects, simply by placing the object between two symbols. This special symbol has its own consciousness. It works directly with your aura and chakras and varies its healing effect depending on what you need at the time of use. Since it is directed by the Higher Self, it always has a beneficial effect and can never be misused to cause harm. The symbols can be placed under a massage table, or under the bottom of a chair. They can be placed on the wall (for meditation) or held against the body with the print facing the area needing healing. Whilst I was down in Wiltshire during June of '99 this huge formation arrived on the slopes of Clifford's Hill at All Cannings. I don't think I'll ever forget this formation that arrived on the 24th, because I was really suffering from back pain at the time...In fact it was touch & go as to whether I was going to make Wiltshire at all that year. Although I was faced with a 15 - 20 minute walk that was all uphill, I was determined to get into it though, because at the time I believed the formation to be new and unreported. As it all turned out it was well worth the effort...But rather surprisingly, I wasn't expecting to be confronted by squares and oblong pathways. The whole thing was alive with energy, which I think as a consequence left me feeling rather drained and a bit befuddled. It seemed to take an age for me to work out what is basically quite a simple design. Interestingly I learnt, that Stuart D*** of "cropcircleconnector" also encountered a similar experience of disorientation, whilst photographing it later that day. Easing myself down, I laid out for a while on its springy mattress and settled down to soak up some warm sunshine. I was in no hurry to get back to the car, as the getting into and out of was quite painful. However much to my surprise on that particular occasion, I only felt a slight pain as I cautiously got in. Getting out of the car at the other end though I never felt a thing - the pain had miraculously disappeared! Still pain free when I arrived back home a few days later, I viewed for the first time the aerial shot of the formation and learnt for the first time that this square of squares within a circle, was an ancient healing symbol known as "The Antahkarana"...OMIGORD! Had this particular formation contained healing energies? After all as all fellow sufferers will tell you, back pain doesn't just disappear like that...does it? "The Antahkarana is an ancient symbol that has been used as a tool for healing and meditation for thousands of years. Merely having the Antahkarana symbol in your presence helps to focus your energy and increases the power of your healing. This will reduce the time needed to heal, and allow deeper issues to be worked on. It is also used to enhance meditation or any other modality used in energy work towards the purpose of health, well-being and connection to the higher power. The actual size of the symbol is larger than the male, and the 7's are longer and narrower. The symbol is multidimensional. From one perspective it appears to be two dimensional, being made up of 3 – sevens on a flat surface. The three sevens represent the seven chakras, the seven colours and the seven tones of the musical scale. From another perspective this symbol appears as a three dimensional cube. 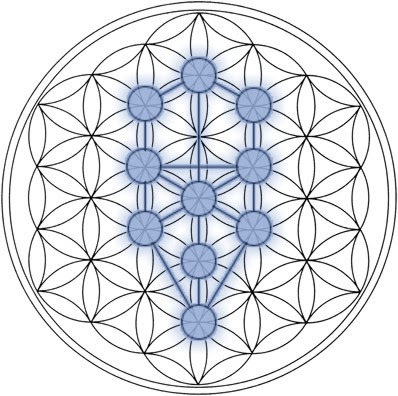 Its energy moves up from two to three dimensions that can be seen and continues up through unseen dimensions all the way to the highest dimension – the dimension of the Higher Self.The actual size is smaller than the female, and the 7's are shorter but thicker. There are two versions of the Antahkarana. The female version is slightly larger than the male version. The female version should be used if you feel that more compassionate energy is needed. The male version is used if you wish to access more assertive energy. Or consider using both if you wish the yin/yang balance. To use an Antahkarana in your energy work, hang the stained glass symbol on the wall, or in a window of your healing room, facing the person or area to be healed if possible. However this is not necessary as it doesn’t need to be seen by the person receiving the healing for it to work. Or hang the symbol in your meditation room and use it for contemplation. You could also simply enjoy it in a window of your bedroom or workplace and still receive benefit from it."